Whether it's to store your bicycle in winter or simply for those times when you're not using it, these screw-in bicycle hooks help to stow your bike securely out of the way, yet keep it easily accessible when you want to go for a ride. 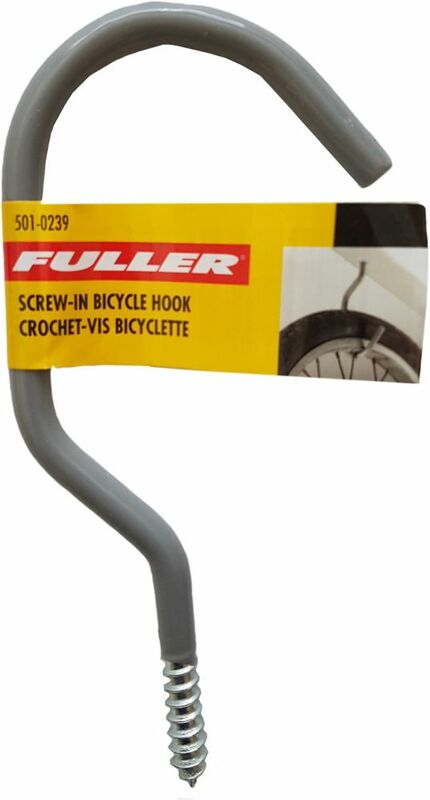 Solid steel construction ensures the hooks won't bend when hanging your bicycle and a vinyl coating stops the rims on your bike from getting scratched. No tools are needed to install these screw-in hooks. It's easy to organize and add functionality to your garage, basement, garden shed, or just about any room in the house with these straight peg hooks. Made of steel, these 1-1/2-inch long hooks were designed to easily hang on pegboard and hold a variety of household objects from toys to tools making storage and getting rid of clutter a breeze. Any hard-to-hang or oversize item will easily hook onto this jumbo 12-inch hook. Designed to hold up to 50 pounds and made to install wiggle-free using two pre-drilled anchor holes (screws not provided), organizing and arranging whatever clutters up your garage workshop, basement or garden shed has never been simpler or faster. Tipped with rubber caps for safety, this wall-mounted arm hook is both durable and corrosion resistant. This is the double-arm hook you want for larger, heavier or unwieldy items that simply won't hang securely on a single hook. Designed with two sturdy arms to keep bigger objects steady, and featuring a foam rubber covering to ensure they stay in place, you can attach this hook either to slat wall, or else screw it into any solid vertical surface. It makes organizing the garage, basement, garden shed or workshop fast and simple. A step ladder or extension ladder is invaluable for cleaning out the eaves troughs, trimming tree branches, inspecting or repairing the roof, or any job that requires extra reach. And when your ladder isn't in use, these sturdy ladder hooks conveniently and securely store it out of the way. Vinyl-coated to ensure the ladder doesn't slip off, these hooks screw in to anchor securely in any solid wooden beam or post. Sturdy Bicycle Hooks with a Protective Vinyl Coating Whether it's to store your bicycle in winter or simply for those times when you're not using it, these screw-in bicycle hooks help to stow your bike securely out of the way, yet keep it easily accessible when you want to go for a ride. Solid steel construction ensures the hooks won't bend when hanging your bicycle and a vinyl coating stops the rims on your bike from getting scratched. No tools are needed to install these screw-in hooks.